Has The Zorro Experiment Ended? One wonders if the new Zorro enterprise has ended. Their website won’t come up when I click on the link and their presence on Facebook has backed up considerably from what it was. I had problems with getting the first book and the attitude of the guy in charge, he seemed to think I had a personal grudge against him(his words). I don’t even remember his name. update: the site loads now. Who knows what’s up with those folks? Had so much trouble i don’t think I’ll try whenever, if, the next book arrives. The three shows in this post were all favorites of mine as a kid. The books were all tie-ins, though I don’t believe that phrase was in usage at the time, that Evan Lewis posted on a couple of years back. The three he highlighted were Whitman Books editions, a publisher big on juvenile books of all sorts back then. The only Whitman I have is the Zorro by Steve Frazee(1958). The other two were English editions of the books as part of a Television Favourites Library series by World Distributers (Manxhester) Limited. Unlike the Whitman Books, these were given titles other than the name of the TV series. 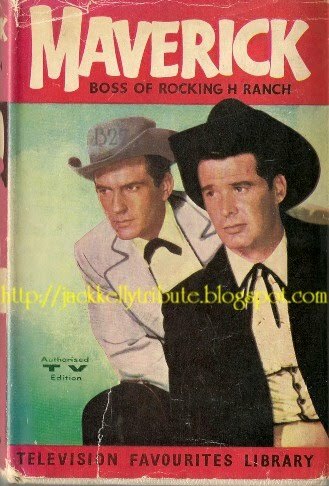 The Have Gun, Will Travel was Perilous Journey by Barlow Meyers(1959) and the Maverick was Boss of The Rocking H Ranch by Charles I. Coombs(1959). I enjoyed this brief excursion back to my long ago youth(who says time travel is not possible). Foe more forgotten books, as always, check out Patti Abbott at her blog, Pattinase. 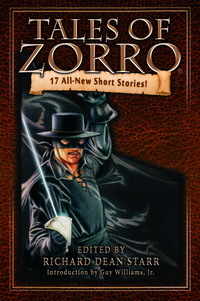 MORE TALES OF ZORRO is the latest collection of sixteen stories of the Spanish Fox from the good folks at Moonstone Books. I touched on the first one a few years back Here. Once again Richard Dean Starr does the editing duties, as well as contributing a story, and the introduction is by Henry Darrow, the first Hispanic actor to actually portray our hero(in an animated series) as well as being involved in the Zorro franchise on a couple of other occasions. Some of the authors in these pages are Joe R. Lansdale, Alan Dean Foster, Timothy Zahn, Win Scott Eckert, John Peel, the late Kage Baker, and Johnny D. Boggs among others. All the characters are here, Don Diego de la Vega, his lifelong friends Bernardo, the mute that poses as his servant and shares the secret of Zorro, and the portly Sergeant Garcia, a soldier of the crown that has a sneaking admiration for the bandit but will do his duty, Captain Ramon, and the thoroughly unlikeable Alcalde(must have a foil for our star). That said, I wish the character owners would let inexpensive editions of Johnston McCulley’s original stories be released. I have the first in paperback, The Curse of Capistrano(The Mark of Zorro in book form) and a handful, courtesy of Evan Lewis(thanks again). Some nice editions were put out by a small publisher some years back, but these days command substantial prices on the used book sites. I can’t justify spending those amounts unfortunately. I just finished a new collection of stories from the folks At Moonstone. 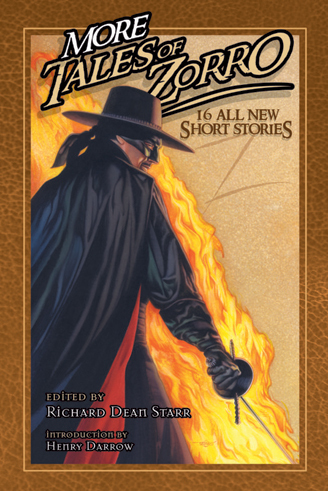 TALES OF ZORRO edited by Richard Dean Starr with an afterword by Isabel Allende. Seventeen new stories by various authors and an introduction by Guy Williams, Jr. His father, Guy Williams , Sr., is my Zorro. I remember watching the Disney series during my childhood. I knew nothing about the character at the time other than it was a wonderful series full of action and adventure. I had no idea of the Johnston McCulley stories, the number of movies based on them. That was of course the infancy of television, three channels, four occasionally. I was just beginning to read a lot. 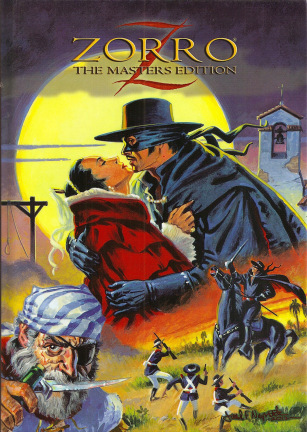 I have read the first McCulley story, THE CURSE OF CAPISTRANO, in the 1998 Tor book published under the title of THE MARK OF ZORRO and Isabel Allende’s novel, ZORRO, which gave the character a back story. Other than that, no fiction until this collection. There have been a few new novels over the years, but I never read them. It would be nice if someone published McCulley’s stories in a nice set of mass market paperbacks(Pulp Adventures, Inc, published a two volume set of stories that are kind of high priced on the secondary market for us regular Zorro fans). This new collection has some nice stories. One by Peter David, COLORS SEEN BY CANDLELIGHT, has Zorro rescuing a young girl being held for ransom that will grow up to be one of our greatest poets. Other fine stories by Max Allan Collins, Ed Gorman(with a couple of co-writers), and a number of other well known authors. Interior illustrations by Ruben Procopio and a wonderful cover for the trade paperback by Douglas Klauba complete the set. 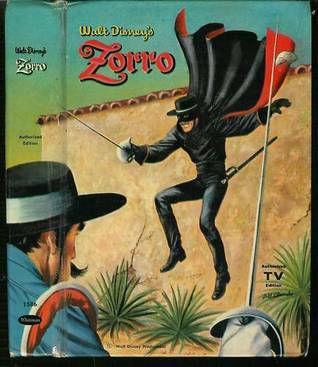 A fine group of stories for any fans of Zorro. There are a few inconsistencies sprinkled throughout, to be expected with different writers working with the same characters. Nothing worth nitpicking about though. Worth a look.